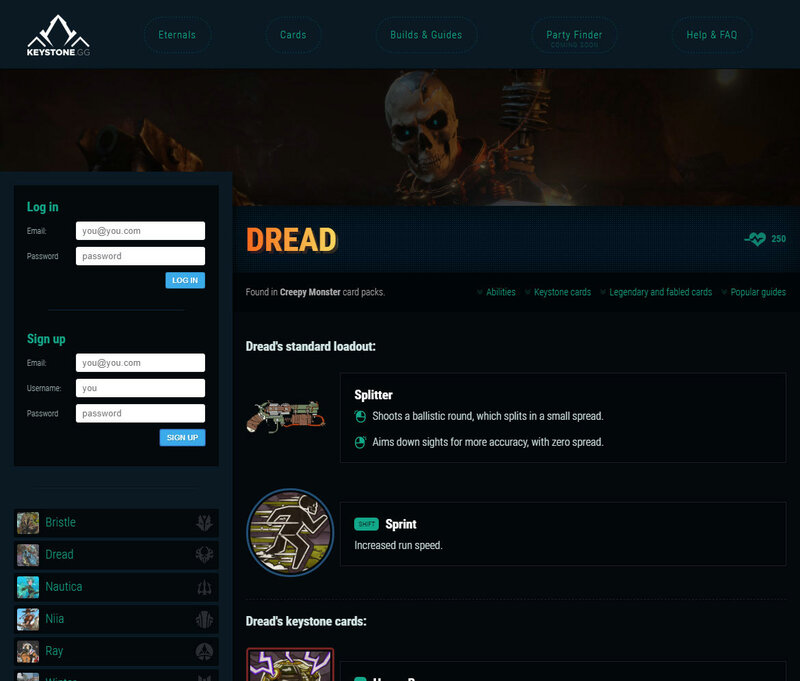 Designed, developed and maintained community database and guide websites for various upcoming and popular video games that were due for release soon, or were strongly establishing themselves in alpha/beta stages. All work was full-stack: complete design and development of both front-end and back-end, including database design and optimisation, on a CentOS LNMP stack. 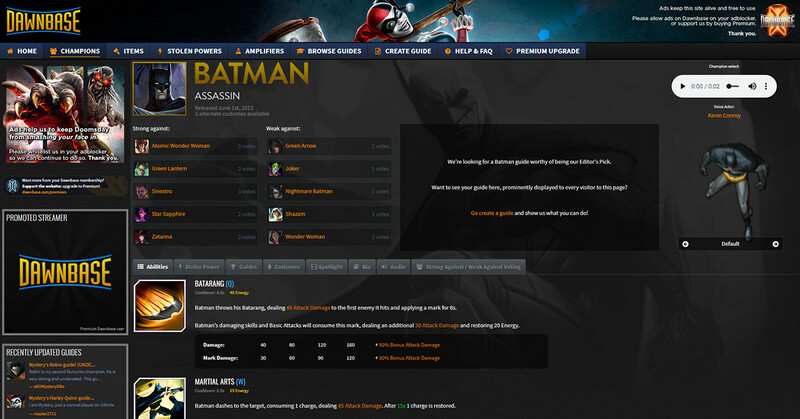 Dawnbase was a database and community guides website for Infinite Crisis, a DC Comics based MOBA title from Turbine and Warner Bros Entertainment. Dawnbase was consistently the most popular website for the game, vastly outstripping external efforts by both well-known wikis and brand competitor MobaFire. The website showcased a lot of audio and art assets from the game, originally pulled out of the game files by myself using a custom-built disassembler, though later some art assets were given to me directly from developers Turbine once we had established an ongoing professional partnership. Dawnbase was ultimately retired once Infinite Crisis announced it was shutting down. Overwatchers was a player/team finder built in the run-up to the release of Blizzard's next goliath title, Overwatch. 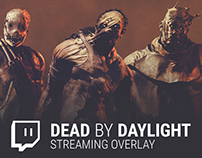 The site let people sign up and customise their profile with information such as their playstyle (casual or competitive, for instance), typical times of day played, preferred characters, and so forth. 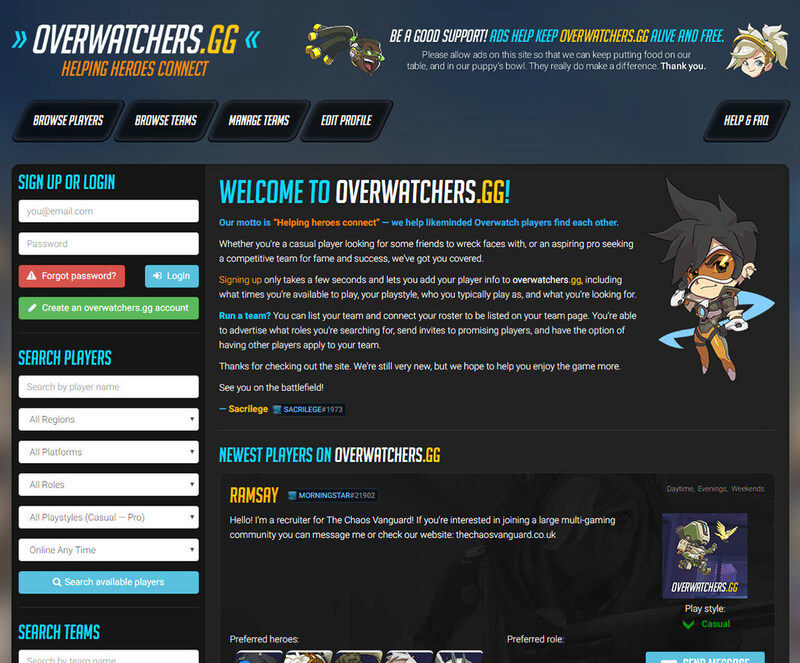 Users could also search for other people based on those parameters, with the site aiming to connect similar people together to enjoy their Overwatch experience better. Overwatchers went live on Overwatch's launch day but all announcements of the site were drowned out by a sea of excitement over the launch, and other websites which also aimed to match players together (albeit much simpler and less reliably) were gaining traction despite offering a far worse experience. Ultimately, with Overwatch announcing and releasing a looking for group tool, the website was retired. KeystoneGG was a database and community guides website for The Amazing Eternals (originally announced as Keystone), an FPS title from Warframe developers Digital Extremes. As with Dawnbase, tireless hours were spent deciphering the game's raw data files in order to pull art assets to use on the site. The result was an attractive site that matched the game's theme while still managing to look clean and easy to read, even on mobile. KeystoneGG was ultimately retired once The Amazing Eternals announced its indefinite hiatus. 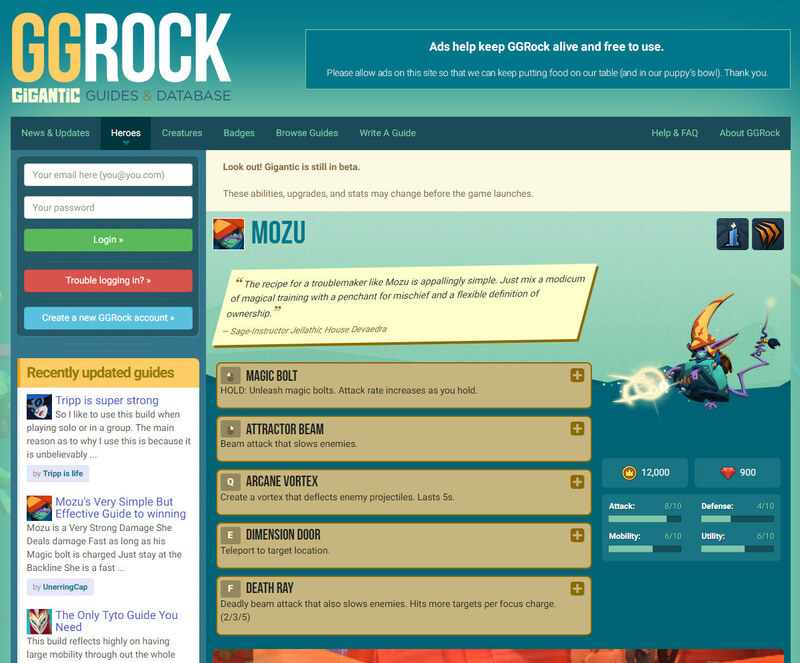 GGRock was a database and community guides website for quirky third-person MOBA title Gigantic, and was approved of and promoted by development studio Motiga. The site was retired once Gigantic announced shutting down. 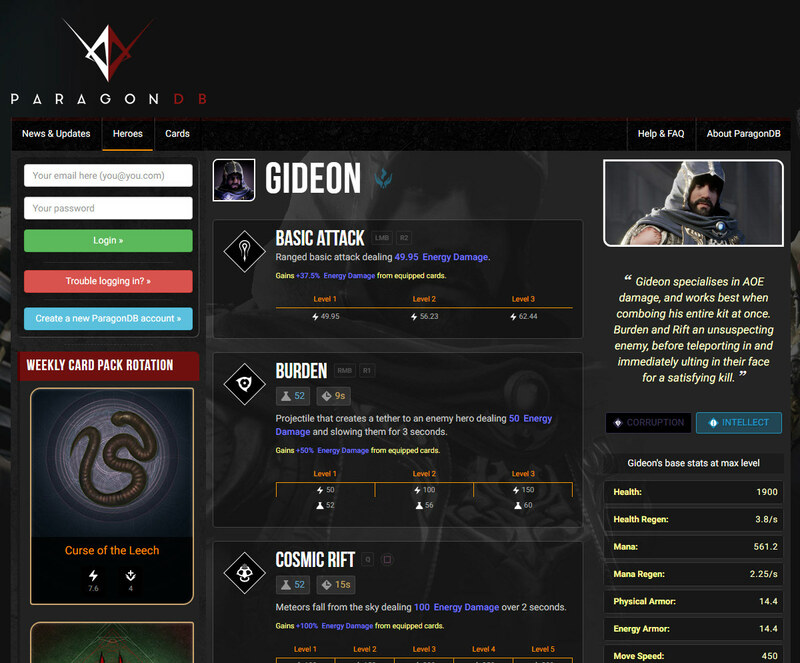 ParagonDB was a database and community guides website for Epic's ambitious and competitive third-person MOBA title Paragon, and was built to also tap into the game's server APIs in order to fetch realtime data such as in-game card pack rotations and in-depth player statistics. The site was retired once Paragon announced shutting down. A few of the gaming community, database and guide websites I've designed and developed in the past.